A misfired post, an awkward typo, a thoughtless tweet—we’ve all been there. Social media blunders aren’t ideal, but they happen to the best of us. Even the biggest brands make mistakes. The difference here is, unlike most of us who can salvage our personal social media profiles with a quick delete, brands aren’t so lucky. Their social media blunders are called-out, made into memes, and for the truly unfortunate, thrown into haranguing listicles that have the word “fail” in big, bold letters in the title. While bad content isn’t an indelible mark on someone’s branding—it can come pretty close. We’re not saying you’ll definitely mess up at some point… but yes, you’ll definitely mess up at some point. It could be just a typo, or it could be accidentally sharing your competitor’s achievements. The magnitude of the error will vary, but its certainty will not. Alright, that’s enough doomsaying for one day. Why we’re actually writing this piece is to show you how to handle these situations, should you ever find yourself in them. Because half of crisis-management is putting on a good face and delivering a solid follow-up—setting up a system to avert such blunders is the remaining half. One of the most important things to do during a social media crisis is to react. That doesn’t necessarily mean, putting out a public message. You can take a brief time-out to decide how your response post is going to be. Sometimes, it begins with taking care of things at the home turf. For brands with a steady stream of scheduled social media content on the conveyor belt, the sensible move would be to first, pause all your scheduled posts. 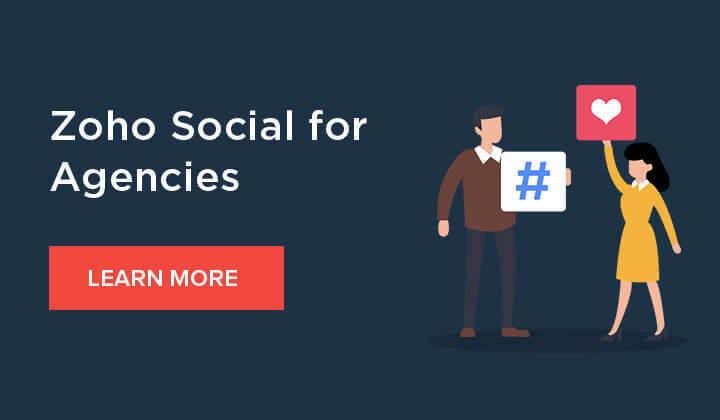 This can be done easily with a tool like Zoho Social—your social media manager doesn’t have to fret about a random and untimely blog piece slipping through the cracks and being tweeted out, while your brand is busy figuring out how to get out of a social media soup and is playing low-key on the promotions for a while. Once you’ve frozen all social media activity temporarily, it’s time to jump into action mode. One of the surest ways of handling a mess your brand has created is simply owning up to the mistake. For instance, let’s look at the infamous Adidas mess-up. Following the Boston Marathon in 2017, the sports brand sent out an email that had a very unfortunate subject line that read “Congrats, you survived the Boston Marathon”. Scores of horrified netizens immediately took to Twitter to express their distaste, since the subject line was perceived to be offensive to the victims and survivors of the Boston Marathon bombings of 2013. What they’ve done right here is not just own up to their mistake and apologize, but also extend their support and respect to the event itself, without making it all about themselves. Instead of defending themselves and drawing more ire, Adidas addressed the issue directly. They decided to show respect in a situation where they were construed to be disrespectful. Sometimes, in a sensitive situation, it’s better to own up to the mistake than over-explain yourself. Adidas showed exactly how that’s done. There’s of course, more than one way you handle a situation. If the magnitude of your blunder isn’t too great, and you merely made a typo or copy error, an apology might be unnecessary—and admitting you have a flawed system in place could be dangerous. What do you do then? This is where many popular brands have filled in the answer for us. Franchises like Burger King and Wendy’s go all out in embellishing their social media with humor and satire these days. By turning a mistake into something endearing and light-hearted, many brands get away with—and even capitalize on—everyday faux pas. By humanizing the situation, they’re able to pass off small errors as genuine slips by a person running a social media handle, rather than glaring imperfections made by an organization. For instance, around this time last year, McDonald’s Twitter handle had let slip an unfinished tweet. It was a scheduling error, which resulted in us seeing the fast food chain’s #BlackFriday tweet plan instead of the tweet itself. While it wasn’t a mistake that made people boycott the brand in rage, it was still shoddy work by the social media team of one of the largest fast food franchises in the world. It’s not the best save we’ve seen, but still—well played, McDonald’s, well played. There’s no need to stop yourself from coming up with a creative response to a social media blunder. The fact is, there is no one right way to do it. Nevertheless, these are some ways to address issues on social media, without aggravating the situation or making the problem worse. So go out there and publish great content. May your social media campaigns never be misunderstood, nor your follower count dwindle due to a bad post. Just remember to never re-tweet your competition, and you’re golden!